Fans and art collectors of Guy Harvey will delight in the new watercolor over ink illustrations available at the Custom House Museum, a series Harvey custom created to accompany his Key West Art & Historical Society exhibit “Depicting Hemingway: Guy Harvey Sketches ‘The Old Man and the Sea.’” The exhibit’s 59 exquisitely detailed pen-and-ink illustrations are based on the tale of Santiago the fisherman and his battle with the fish in Hemingway’s Pulitzer prize-winning novella “The Old Man and the Sea,” a book Harvey’s mother introduced to him when he was 11. The internationally-renowned marine wildlife artist and conservationist grew up in Jamaica with a deep love of the ocean and all that was in it. Though constantly drawing the ocean subjects he was inspired by, his studies began not in art but in Marine Biology at Scotland’s Aberdeen University, and later Fisheries Management from the University of West Indies where he earned his doctorate. Today, his artwork of sportfish and marine life is prolific, depicted on everything from posters to prints to tees and coozies. An advocate for the ocean, Harvey uses his commercial success to help fund scientific research and educational initiatives through the Guy Harvey Ocean Foundation. 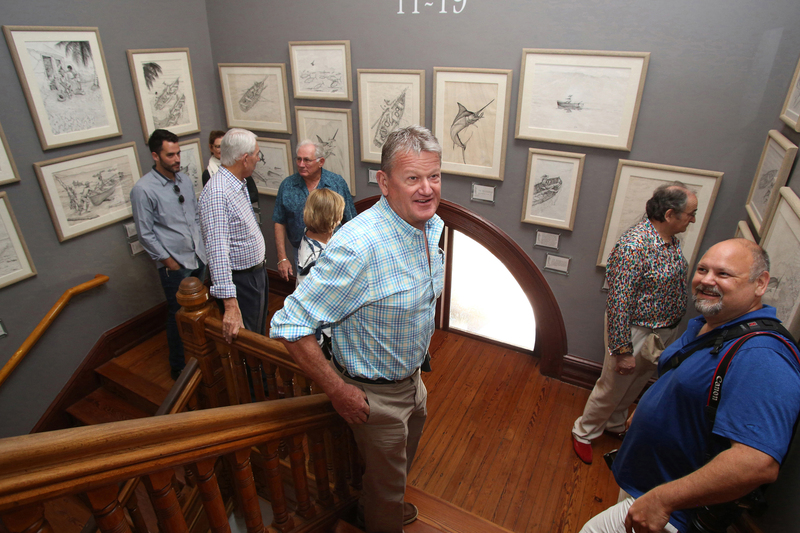 We caught up with Dr. Harvey to talk about the pen-and-ink illustrations that kicked off his art career, created when he was only 19. KWAHS: That’s quite an accomplishment for such a young artist. What kept your focus & motivation so sharp? Harvey: The story is the most famous fishing story of all time and I love fishing! I grew up fishing with my parents and with local artisanal fishermen in SW Jamaica. They caught big fish on hand lines from small boats so I could relate to Hemingway’s story. Harvey: Each image varied tremendously in terms of time taken. The project took about a year complete. The story has a beginning and an end, I considered 60 pieces of art sufficient to cover the story. KWAHS: How did you decide which scenes to depict? Harvey: I began with the action scenes of Santiago fighting the marlin and worked my way back into the supporting scenes based on my experiences in Jamaica. KWAHS: How do you view the creation of these original drawings in the bigger picture of your current career? Harvey: The series formed the first one man art show I attempted in October 1985 in a well-known Kingston gallery. The prints that resulted were my first effort at selling reproductions and the early success encouraged me to take the prints in to the US market and these were launched at the 1986 Ft Lauderdale Boat Show. I have been doing that show now for thirty consecutive years. KWAHS: How has your work changed since then? Harvey: The range of media I use now was all developed from the illustrative pen and ink style. I have since made forays into watercolor, oil paint, acrylic, and underwater photography. Many of the pieces are large, as the fish are large and they need a big canvas. KWAHS: Anything else you would like the public to know? Harvey: The sale of all GH merchandise generates royalties from which a percentage is donated back to the GHOF. These funds have supported our research and educational programs for the last 19 years. In addition to the new watercolor illustration reproductions available for purchase, Harvey’s KWAHS exhibit illustrations have been collected in Harvey’s special edition hardbound book “Santiago’s Finest Hour.” Original illustrations and watercolors are available upon inquiry. Harvey’s exhibit at The Society is sponsored in part by Dave and Cheryl Copham. For more information, contact Director of Retail Operations Dan Ayers-Price at 305.295.6616 x 104 or visit the Museum Store open daily 9:30am-4:30pm. Your museums. Your community. It takes an island. Dan Ayers-Price, Key West Art & Historical Society Director of Retail Operations, stands among a collection of Guy Harvey offerings at the Custom House Museum gift store. Recently acquired Guy Harvey offerings include museum-quality matted reproduction prints and signed and numbered colorized limited-edition prints of Harvey’s ‘Santiago’s Finest Hour’ sketches collection.